Enter a serene Chinese garden to reflect on the great questions of the world while you take in your picturesque surroundings. Click here to play! 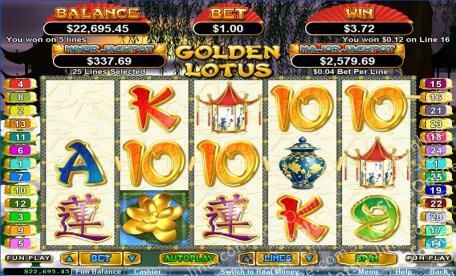 Watch the lotus flowers float while you consider your reflection in a deep blue pond in this fantastic slot game. See if you can interpret the ancient symbols that hold the answers to all of life’s questions by spinning in the Chinese symbols. These hold the highest payout of the game and will award up to 8888 times your line bet if you can spin two or more across an active payline. You’ll also be captivated by the stunning Geishas that roam these gardens. Spin two or more across a payline and you’ll get up to 1250 times your line bet. There are plenty of other symbols to collect as you contemplate life, including garden statues, lanterns, and priceless pottery. Though, the key to peace in this game is the lotus flower. There are two �' gold and white �' and they are both special symbols. The golden lotus is a substitute that will replace all other symbols (excluding scatters) to bring in more wins. It will also trigger a bonus feature. The White lotus is a scatter symbol. It will multiply your total bet and trigger a free spin bonus feature. So, find peace, and cash, in this Chinese garden. The White Lotus flower is a scatter. It will multiply your total bet by up to 500 if you spin two or more anywhere on the board. If you spin three or more, you will trigger a free spin feature in which your payouts could be multiplied up to five times. The golden lotus is a wild. It will replace all others, excluding scatters, to help you bring in more wins. It will also trigger a bonus feature. The Golden Lotus bonus feature is triggered when you spin three or more golden lotus flowers anywhere on the board. During this game, you will choose four out of eight flowers to reveal your bonus prizes of cash, multipliers, or free spins.